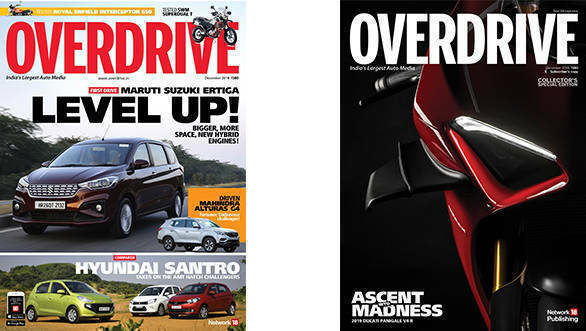 The December 2018 issue of OVERDRIVE is out on stands now! 2018 has been a bit of whirlwind for us. And no sooner did we begin it than the year has come to an end. Action-packed as it was, it is now time to say goodbye and here at OVERDRIVE, we do it in our own style with the last issue of 2018. We test a bunch of cars and motorcycles for the December issue of OVERDRIVE magazine which is on stands now. The two big vehicles we test for this issue are the new Maruti Suzuki Ertiga, and the Mahindra Alturas G4. Then there are the JTP performance twins from Tata Motors, the Tata Tiago JTP and the Tata Tigor JTP. Upwards and onwards, we also drive the new Volvo S60 and Audi A6, and also take the Range Rover Evoque droptop to a wildlife safari. The Hyundai Santro is already out and this time we take it for a comparison with its closest rivals, the Tata Tiago and Maruti Suzuki Celerio. Onto two wheels, we test the brand new Ducati Multistrada 1260 Enduro in the Tuscan countryside. Editor Shubhabrata Marmar takes the Royal Enfield Interceptor 650 for a 1,000-km ride to Goa, to its launch. We also test its cafe racer sibling, the Continental GT 650. The SWM Superdual T shows what a big single is capable of in adventure clothing, while we also test the smaller TVS Radeon and Hero Destini 125. We compare the Hero Xtreme 200R against the TVS Apache RTR 160 4V. Over in motorsport, you can read our reports and features on Lewis Hamilton, MotoGP Japan, as well as the INRC Rally of Arunachal, F1 and the WRC. And this isn't all. The December 2018 issue also features the regular columns as well as motorcycle and four-wheeler news. There's plenty more where that came from, as long as you rush to the stands to pick up your own copy of the issue. So what are you waiting for? Run. Team OVERDRIVE wishes all its readers a very happy new year as we bid adieu to 2018!